"I was going to take a picture of your WONDERFUL bird feeder at our house in NC. It is THE BEST!! The sun shines right through it in the evening before sunset, and it is gorgeous! We truly love it! So do the birds!" This package lets you start enjoying your bird feeder right away. The wonderful funnel/scoop has a nifty open and close lever. You can just scoop up the seed and easily fill your feeders. This scoop works with all my bird feeders and makes filling them a breeze. The scoop comes already filled with "Julie's Blend" bird seed mix. I've had great success with this high energy, no-filler seed mixture. It has three types of sunflower seeds (striped, black & hulless) and peanut hearts. Also included is my Top Ten Tip sheet for bird feeding. 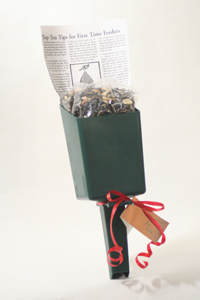 This Scoop & Seed Package is a thoughtful addition to bird feeder gifts.